The start of the fall season is an exciting and also a very hectic time of year in my family. The cooler mornings and nights, return to routines, mums appearing on everyone’s door steps, and even the Halloween and Thanksgiving decorations starting to appear in the stores. I LOVE the back to school and fall season. September in many ways feels like a 2nd January with new resolutions being made about getting organized, setting up new household chore schedules (there is always hope this time it will stick! ), and getting back to “round the table” family dinners. Why? Family dinners matter! During the week, it is very easy to bypass having dinner as a family. One son has to be at hockey at 6pm, the other at 7 pm, there is a parent info night at 6:30, and my husband is often arriving home from work after 7pm. It is a constant challenge, a constant struggle. ♥Staying Healthy: cooking healthy and simple meals at home on a regular basis is an essential part of good health and keeping my family healthy. It does not have to be gourmet or fancy, just simple recipes with wholesome ingredients. Plus, real food just taste better. ♥Happier and Healthier Kids: families that eat dinner together just a few times a week have kids with better performance in school, lower drop out rates, and lower rates of substance abuse. There is tons of research on this and it tells us family dinners matter. ♥Family Connections: With everyone moving in a thousand different directions during the day, just sitting down and talking to each other for 20 to 30 minutes of focused time where we can connect is something I treasure. It is often when I learn about something funny that happened at school, a challenge with a class, or something that is totally trivial (like what rapper is dating what celebrity). The topic does not always matter, the time does. ♥Build Lifelong Habits: I want my kids to grow up with family dinners as part of their childhood, seeing it as a normal part of life. The importance of cooking at home, trying new foods, and sitting down at the table all go back to reasons #1 to #3 above. And yes I know…even with the best of intentions it is not easy to do. And figuring out what to make for dinner and having an organized plan week after week is not easy. ♦ After I know everyone’s schedules for sports and other commitments, I pick 2 to 3 days that it looks feasible everyone will be home. Family Dinner Nights are Declared! I let everyone know that on Monday, Tues, and Thurs we have dinner together. Don’t make plans, plan your study session for after dinner, be home from whatever it is you are doing with friends etc etc. I let my husband know to plan to be home in time. ♦Come to the table without your electronic piece of your anatomy! Put the phone away from the table so you won’t be compelled to “just see who is messaging me….it might be important” Yes, I want to see your face looking up and your friend can wait for you to like his snapchat/instagram or whatver it is post. ♦Have a plan for your week of dinners: a huge part of dinners falling apart is not having a plan. We know this all too well at The Dinner Daily. This is a whole other topic worth writing about but if you don’t have a plan for dinner, it is so much harder to put it all together on a daily basis. That’s why we do what we do – to make it easier for all of us. Good luck navigating the fall everyone! And our best wishes for many family dinners in the weeks to come. 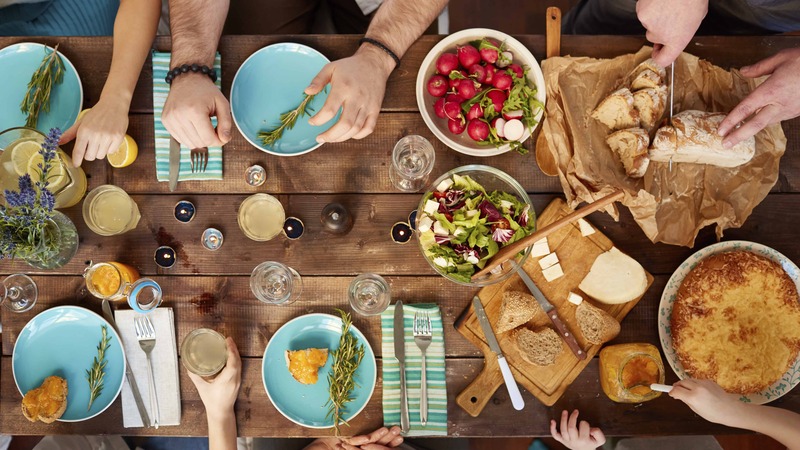 Want some help in making family dinners happen in your home? Learn more about The Dinner Daily.